to meet his unique requirements and will be run by the ROAL Motorsport team. The 47-year-old lost both legs in a serious crash while racing in 2001, but overcame his disability to return to motorsport. Among other things, Zanardi drove for BMW in the FIA World Touring Car Championship (WTCC), where he stood on the top step of the podium on four occasions. Having won two gold medals on his handbike at the 2012 Paralympics in London (GB) and completed a test in the BMW M3 DTM in the same year, he is now set to contest a full season for BMW for the first time since 2009. "Alex is back! I cannot express how delighted I am that one of the greatest heroes in the history of BMW Motorsport is returning to the cockpit of one of our racing cars," said Jens Marquardt, BMW Motorsport Director. "From both a human and a sporting aspect, Alex is a role model to all of us. I am sure he will approach this new challenge in the Blancpain GT Sprint Series in the same manner we have become accustomed to from him. You can really sense just how much he has missed competing on four wheels. Modifying the BMW Z4 GT3 is a challenge for our engineers. However, we gained valuable experience in this regard when we modified the BMW M3 DTM in 2012, and that will come in very useful now. As far as we are concerned, there is nothing preventing Alex from making a successful comeback." 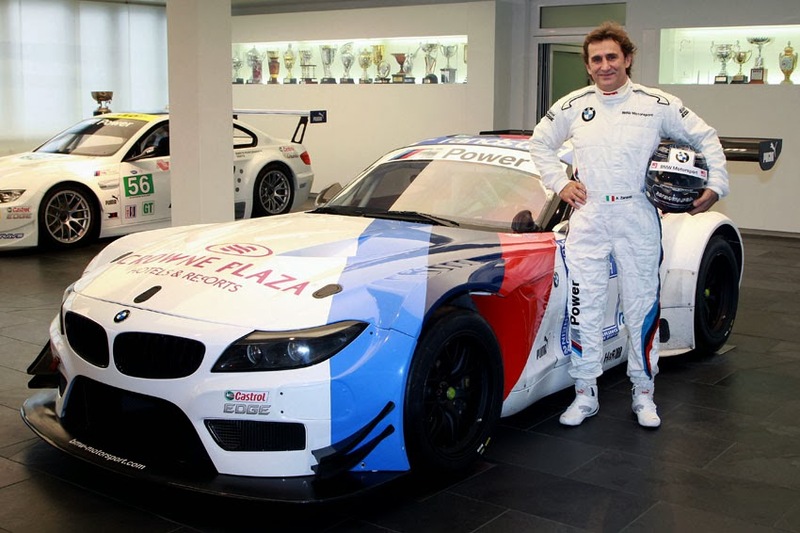 Zanardi added, "Even after leaving the sport in 2009, I was still a racing driver at heart. When I took to the track in the BMW M3 DTM at the end of 2012, I immediately got itchy fingers again. Ever since that moment I have been toying with the idea of returning to motor racing. Together with BMW we have looked at various options. I am even more pleased that it has worked out with my old friends at ROAL Motorsport. I would like to say a big thank you to BMW for this unique opportunity." Zanardi raced for the team belonging to former BMW DTM champion Roberto Ravaglia (IT) in the FIA European Touring Car Championship (ETCC) when he made his first comeback in 2003. Back then, a BMW 320i was adapted to suit his special needs - Zanardi accelerates using his hand. The 1997 and 1998 ChampCar Champion raced successfully in the WTCC from 2005 on, claiming four victories at Oschersleben (DE), Istanbul (TR) and Brno (CZ, two wins). Zanardi and ROAL Motorsport went their separate ways - for a while - at the end of the 2009 season. "Alex and I have gone through so much together in motorsport. Therefore, I obviously did not hesitate when the opportunity arose to send him back into action for ROAL Motorsport in 2014," said Ravaglia. "The sprints in the Blancpain GT Sprint Series are tailor-made for Alex. We will do everything in our power to give him a strong car, with which he can reproduce the performances and success we have seen from him in the past." The 2014 Blancpain GT Series season features both endurance and sprint races. Zanardi will drive one of the two ROAL Motorsport BMW Z4 GT3s in six of the seven sprint races, which each last one hour.